A man whose car hit the central barrier of the M4 in Wiltshire has died. The 66-year-old's black BMW crashed on the westbound carriageway between junction 16 for Swindon and Junction 17 for Chippenham at about 15:39 BST on Friday. He was treated at the scene and airlifted to hospital, where he later died. Police appealed for any witnesses or motorists who may have captured dashcam footage of the crash to contact them. 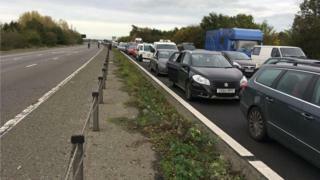 The M4 westbound was closed for four hours while investigations took place.